East meets West - North meets South الشرق يلقى الغرب - الشمال يلقى الجنوب: London 2012 Olympics tickets, anyone? London 2012 Olympics tickets, anyone? "Rome is the mob. Conjure magic for them and they'll be distracted." A task force has been drawn up, drawing on past lessons learned. It will deploy 15 000 men to maintain law and order, protect key installations, supervise prisons, secure archaeological sites and facilitate humanitarian aid. This isn't the COBRA strategy for London, night 4 of the riots, rather it comes from the 70-page plan for Tripoli should Qaddafi's regime collapse, as seen by the Times. The UK riots across its major cities has drawn witting and unwitting parallels with the Arab Spring. Darcus Howe came onto Radio 5 Live and drew parallels with "Asad" of Syria and his crackdown, saying that this wasn't the worst rioting in living memory and that it had been blown out of proportion. There was general sympathy for the police - seen as underresourced, understaffed and lacking suitable rules of engagement. They sat back, it was commonly thought, because they were in a lose-lose situation. I suppose because everyone now has a cameraphone and any police physical violence would almost instantaneously find its way to YouTube. In an age of social media in which disgruntled youth are frequently more skilled with smart phones than are the adults who police them, London authorities believe handheld technologies may have helped those trying to instigate violence to spread their message. Rather than shouting through a megaphone — as in the infamous 1985 riots on the Broadwater Estate in Tottenham — today's rabble rousers are more likely to organize online and with the aid of their iPhones and BlackBerrys. As the riots unfolded, some used Twitter to encourage violence. "Everyone up and roll to Tottenham f*** the 50 [police]. I hope 1 dead tonight," one man tweeted. Which brings me to the most interesting comment. One of the Radio 5 Live callers argued that last night, Twitter and Facebook should have been shut down. Now doesn't that sound familiar? There are those that denied social media played a defining role in the Arab uprisings, including Malcolm Gladwell in the New Yorker and David Kravets of wired.co.uk. But nobody told the ruling entities. In Tunisia as early as August 2008, the regime shut Facebook for 16 days but lifted the ban after pressure from cyberactivists. Twitter played little role in the Tunisia uprisings, since there were only about 200 active accounts pre-revolution, out of 2000 registered accounts. Instead it was Facebook - two million people talking about action on their accounts. This didn't go unnoticed. One of the Tunisian activists suggested that the Tunisian authorities attempted to harass those posting on Facebook. "If they became aware of you on Facebook they would try to divert your account to a fake login page to steal your password." 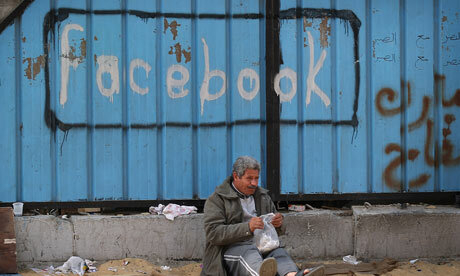 Egypt shut down all internal internet traffic to Facebook and Twitter during the uprisings. Syria shut down internet traffic briefly at the start of June. But the internet finds a way as I've blogged about. There are other tactics employed by the authorities - it's an incitement game. Reports have sprung up and propagated through social media that Mark Duggan's gun was a replica. This has been dismissed. But the report by the Times that both shots fired, including the one that hit the policeman's radio came from a police firearm have not been dismissed. Without social media, without 24 hour television to make the riots and the rioters famous, this wouldn't have escalated. The rioters have a stage, a recorded, globally disseminated stage that makes the police nervous. I wonder if it's time for Mi5 to get on Facebook and Twitter. It's a routine that used against extremist ideologues - we just have to put it into practice with these social media galvanized riots. Develop false online users to spread disinformation, so-called sock puppets and astroturfing. If society lets the rioters employ social media successfully that's a big battle that the rioters and the opportunists who are aggregating, have won. They're tech savvy and enabled. They have a global stage and they know it. The global jury, they believe, will protect them from police outrages. The army on the streets? never! There's a disturbing blueprint here. Heavy handed responses to protests in the Arab Spring found their ways to YouTube which galvanised and even enflamed public opinion, contributing to the reaction against the ruling system. The police could go in heavy handed in riots in London in the 80s but now every rioter has a cameraphone wired to the internet and thus is also a potential reporter. They can cause damage, elicit a response, get it recorded, and upload. The whole set could be done in a matter of minutes. The lawlessness is attractive, too, for the professional criminals, who can profit from the indiscriminate violence and police focus elsewhere. How do the numbers add up? There were 6000 police on the streets of London last night. Cameron has indicated this will increase to 16000 tonight. According to official figures, the Met has about 32 000 and nearly 9 000 support officers and special constables, which represents a total force of 41 000. Specialist police officers and helicopters have been sent from other counties. The standard figures for each borough are small though - 719 police officers for Croydon; 738 for Hackney for example, but there are over 7000 police in specialist operations and part of the Specialist Crime Directorate (which tackles serious and organized crime) and many of these will have to be drafted. It's a really good time to be a part of organized crime in the capital. Over 400 people have been arrested in London, over 100 in Birmingham. This is a good time for riots in the capital. The Met lost Sir Paul Stephenson and John Yates to the phone hacking scandal. Though they may have been compromised individually, they were the officers in charge, respectively, of the Met, and counter-terrorism at the Met. Yates was responsible for organizing police deployment for the London 2012 Olympics. It's August, and many police, politicians are on holiday. Both Cameron and Milliband have had to return from their holidays, in Italy and Cornwall respectively. Don't worry, Ed, you can get a taste of Italy in Cornwall here. The numbers stack up on the sides of the rioters, because they can aggregate through social media. If one hooded criminal attacks a shop, several police officers can tackle them. But it's maths. If one hundred criminals attack shops, you need superior numbers and suitable rules of engagement. There's going to have to be anti-riot tactics employed because the numbers don't stack on the side of law and order. How many people can you arrest? There are seven million people in the capital. According to the 2001 census, Croydon alone has a population of 269 000. For the underclass and the criminals who live in the shadows, this is a once in a lifetime world stage, with the whole nation debating them. They have a voice, and the voice is other people. What do you do with those arrested? Rioting is a public order offence (covered by the Public Order Act 1986), not terrorism. So the draconian anti-terror legislation that found its way into every avenue of society during the shadow of the Bush-Blair "Us against them" years, has no consequence. Curfews could be imposed under the Anti-social behaviour act, 2003. Non-lethal lachrymatory agents could be disseminated, even over a large scale by helicopter. There are going to be some incredible media images, whatever happens. Cameron will have to authorise the use of riot control agents. There's no other way.Then the humanitarian language and moral high ground with which we criticize the abuses of other regimes will seem to ring slightly more hollow.There are some interesting precedents. The United States used riot control agents against the relatively peaceful Bonus Marchers in 1932. The public outrage was muted because it was generally felt that maintaining order justified these methods. To quell the massive unrest in Los Angeles in 1992, following the acquittal of four police officers for the beating of Rodney King, 4000 armed forces personnel were drafted in on day four, with only sporadic violence for two days afterwards. Fifty-three people died during those riots, as many as 2000 were injured and approximately $1 billion damage was done. After the Canucks lost ice hockey's Stanley Cup recently, police had to use tear gas to quell the protests. The big society is quite real - it's out on the streets. Perhaps like the Indian cricketers, Cameron should just pray for rain. Lots of it. More: Rob Dover at Kingsofwar muses on the motivations of the rioters.